The Torres and Cape Hospital and Health Service (HHS) is responsible for the health services of approximately 25,000 people widely spread across Cape York, the Northern Peninsula Area and the Torres Strait Islands. Sixty six per cent of the population in the Torres and Cape HHS identify as Aboriginal and/or Torres Strait Islander. 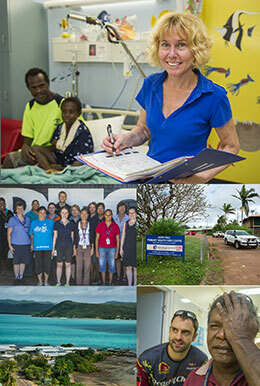 The Torres and Cape HHS also supports a wide range of healthcare providers including outreach teams and visiting specialist services from other Health Services (mainly Cairns) and non-government providers such as Apunipima Cape York Health Council and the Royal Flying Doctor Service. Torres and Cape HHS expanded existing oral health services in Thursday Island in 2015 to provide emergency and general courses of care to Torres Strait Island and Northern Peninsula Area communities. Visiting Dentist services were expanded and waitlists reduced. A 'Dental Blitz' commenced dedicated to treating patients from the outer islands. In 2014 a birthing service commenced at Cooktown Multi-Purpose Health Service for women from the Cooktown region who are assessed as having a low-risk pregnancy. This is after an absence of birthing services for 11 years. The region’s midwifery group practice services were also expanded. Nurse assisted ambulatory renal dialysis services commenced on Thursday Island in 2015 with three haemodialysis chairs. The service will gradually build up to its full capacity with staffing for six chairs. 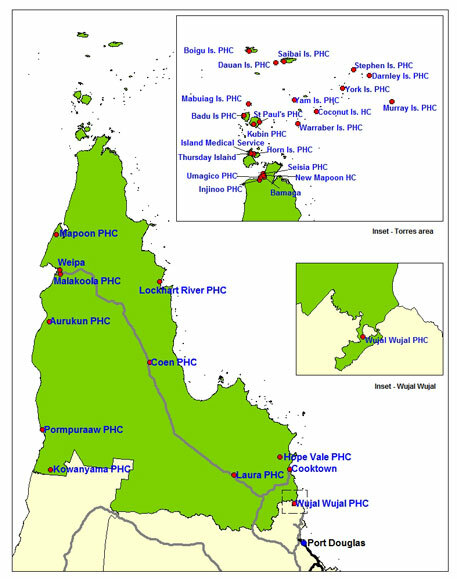 New tele-chemotherapy programs commenced at Cooktown, Weipa and Thursday Island in 2014/15. Low risk cancer patients no longer need to travel to Cairns for chemotherapy. Torres and Cape HHS is hosting a new Tuberculosis Clinical Coordinator as part of the Commonwealth-funded Project Agreement for the Management of Torres Strait / Papua New Guinea Cross Border Health Issues. Torres and Cape HHS delivers a range of acute, non-acute, primary health care and public health services through the operations of hospitals at Cooktown, Weipa, Thursday Island and Bamaga, and 31 primary health care centres (PHCC). Additionally, Torres and Cape HHS maintains a regional hub office in Cairns where business, finance, human resources, patient safety, quality, performance and planning services are based. Some Torres and Cape HHS-wide clinical outreach services are also based in the Cairns hub office. Torres and Cape HHS are progressing with the $36.3 million Backlog Maintenance Remediation Program (BMRP). This four year, large-scale, multidisciplinary rectification and renewal project will inject $36.295 million into improving Queensland Health infrastructure across Torres Strait and Cape York. The BMRP is the single largest infrastructure project ever undertaken by the Torres and Cape HHS and will include up-skilling of HHS infrastructure staff.